"After I was done, all of the emotions just came out, and I started crying on the bench"
Ian Kennedy expected to miss Friday's start against the Miami Marlins to be with his wife Allison, who was in labor with their fourth child. 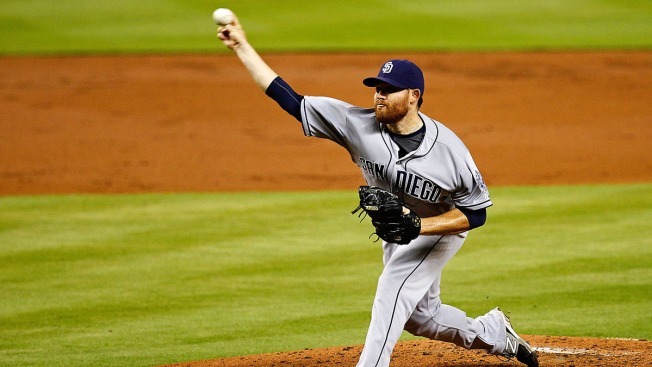 Bad weather delayed Kennedy's flight to Southern California, and he wound up pitching seven innings as the San Diego Padres beat the Miami Marlins 8-3 in 11 innings Friday night. "It was just a really crazy day," Kennedy said. Kennedy received a call about 10:15 a.m. notifying him that Allison was in labor. He booked a flight, which was scheduled to depart at 2 p.m. After sitting on a plane for an hour-and-a-half with no takeoff in sight, Kennedy called pitching coach Darren Balsley and asked whether he could make his scheduled start. Kennedy watched the birth of daughter Evelyn Nicole at 5:03 p.m. by using FaceTime, then took the mound about two hours later. "It's just an emotional moment when I think about it now," Kennedy said. "I'm just proud of her and Alli because it was so cool to see." Kennedy allowed Christian Yelich's two-run homer in the first, then held the Marlins scoreless over the next six innings. "Given up the homer kind of helped shake it up a little bit," Kennedy said. "I'm out here on a big league mound, and you've got to step it up. ... What are you going to tell your daughter after you're all done?" Kennedy came out with a 3-2 lead and received hugs and high-fives from teammates. "After I was done, all of the emotions just came out, and I started crying on the bench because I get to go home to see her, and I just want to hold her," Kennedy said. Kennedy stuck around and watched the Padres score five runs in the 11th. He has a flight scheduled for Saturday morning and plans to rejoin the team in Milwaukee early next week. "I think that victory was for someone else, too," Padres interim manager Pat Murphy said. "It's pretty neat. I know he didn't get the win, but he pitched seven great innings."